A chic adults only hotel, Domes Miramare, a Luxury Collection Resort, Corfu is the ideal place for a relaxing and romantic break. The property was designed by the Onassis family in the 1960s to host royalty and globetrotters from around the world and retains its glamorous atmosphere but with a modern feel. Set on a private beach and surrounded by olive groves and palm trees this secluded resort offers luxury and tranquillity around every corner. Relax in your elegant hotel room, enjoy a range of treatments at the spa or try yoga classes on the beach. Those who like to keep active can take advantage of the onsite personal trainers, bike ride through the surrounding area or explore the Venetian architecture of Corfu. This hotel does not accept guests under the age of 16 years. Bringing together local and international flavours and serving a delicious range of dishes, including premium meats and vegetarian dishes. Wash it all down with an extensive menu of excellent wines. Enjoy delicious dishes and a menu designed by Michelin star chefs throughout the day. Food is inspired by the fresh locally sourced ingredients and each dish has traditional Mediterranean and Greek flavours with a modern twist. This stylish bar offers an elegant evening full of exotic cocktails and sushi made using fresh local seafood. The open kitchen allows guests to watch chefs serve up Asian fusion options and unique cocktails. 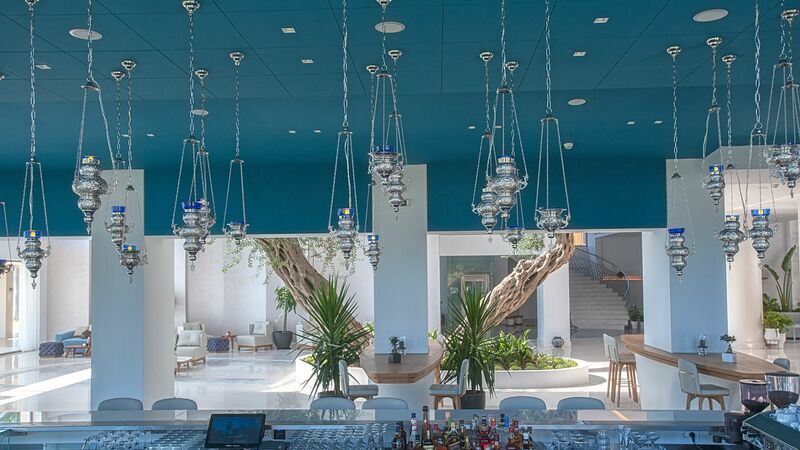 A bohemian style bar decorated in the famous blues and whites of Greece, listen to the sound of the tinkling piano as you take in the views of the summer nights. During the winter the cosy fire is lit next to the bar. Sandwiched between the Ionian Sea and the Domes Miramare’s swimming pool, enjoy spectacular views from every angle. Choose from light bites, including salads, sandwiches and fruit juices, or indulge in a fruity cocktail. 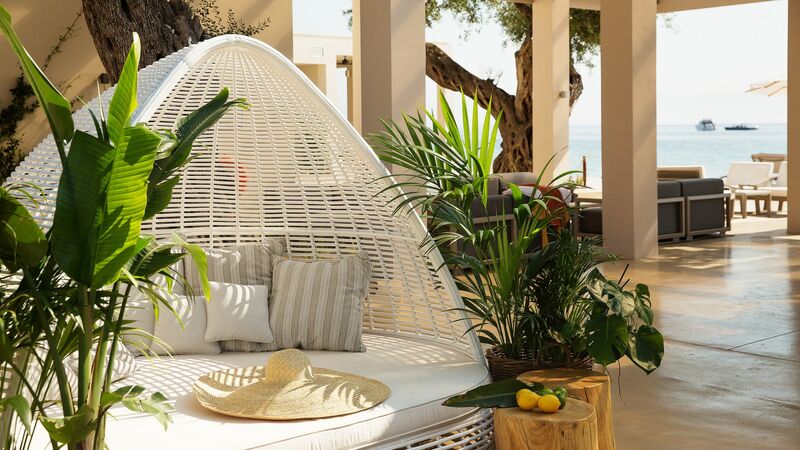 The elegant swimming pool area is surrounded by loungers and parasols and minimalist details where you can relax in the warm Greek sunshine. Domes Miramare is set right on the beach, where you can spend your days lazily soaking up the sun. Enjoy the sun loungers and parasols on the hotel’s private beach and the crystal clear waters of the sea. Relax and fully unwind with a range of treatments at the Domes Miramare. Experts will leave you feeling refreshed and rejuvenated with body wraps, massages, facials and more. Expert teachers lead yoga classes on the emerald green grass of the olive garden which overlooks the Ionian Sean. Private yoga sessions are also available. Personal trainers will help you get fit or stay in shape during your holiday, creating a dedicated personal plan just for you. Located on the golden sands of the beach, Domes Miramare is perfect for lazy days spent soaking up the sun. Explore the coastline with boat trips or try water sports if you’re feeling active. Moraitika is a 10 minute walk from the hotel and offers pretty streets with Venetian style architecture, a lively feel around the beach with bustling restaurants and bars, and little fishing villages with whitewashed buildings and narrow streets. Head further afield to Corfu Town for glamorous shopping in chic boutiques and a UNESCO listed Old Town steeped in history. Wander through the gardens of the palace or enjoy fine wines and fresh seafood as you watch the boats come in to the port. Bright and spacious rooms have a living room with a separate seating and dining area, as well as a large master bedroom with a king size bed. 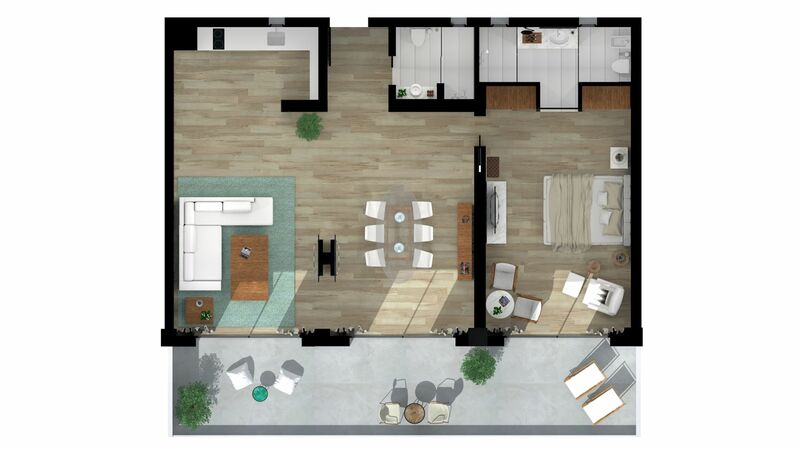 There is also a fully equipped kitchenette, elegant artwork and stylish design throughout. Enjoy views of the sea and olive gardens from your large balcony. There are also two marble bathrooms, each with a walk in shower. The large residences have two large bedrooms with king size beds, a living room with an open plan sitting area, dining area and a fully equipped kitchenette. Elegant artwork and design can be found throughout, and there are three large flat screen TVs. Large balconies offer views of the olive gardens and the Mediterranean. There are also two marble en suite bathrooms and a separate bathroom, each with a WC and walk in shower. These spacious retreats allow you to make the most of the beautiful outdoors. There is a bedroom with a spacious king size bed or twin beds to choose from, a large living area with elegant artwork, a flat screen TV and sitting area. Your private terrace has a jacuzzi and garden furniture and is located in the Exclusive Area of the resort where you can enjoy views of the private gardens. There is also an en suite marble bathroom with a separate bath and walk in shower. Guests staying in the Pavilion Retreat have the added luxury of access to Domes Miramare’s ‘Haute Living’ facilities. This includes access to the Haute living room, which is a VIP style lounge with views of the Mediterranean, elegant artwork and light bites, snacks and refreshments throughout the day. There is an exclusive swimming pool with sun loungers and a bar, as well as a dedicated Haute Living Manager who is available 24/7, VIP check in and out and a farewell gift as a souvenir of your time here. These semi detached residences are located along the Mediterranean and have large bedrooms with king size beds and a spacious living area with a flat screen TV and sitting area. There is elegant décor and artwork throughout, as well as a private garden with direct access to the sea and luscious flora. The retreats are located in the Exclusive Area of the resort where you can enjoy the luxury facilities. There is also a marble en suite bathroom with a separate bath and shower. Guests who choose the Pavilion Retreat can also enjoy access to Domes Miramare’s ultimate luxury ‘Haute Living’ facilities. 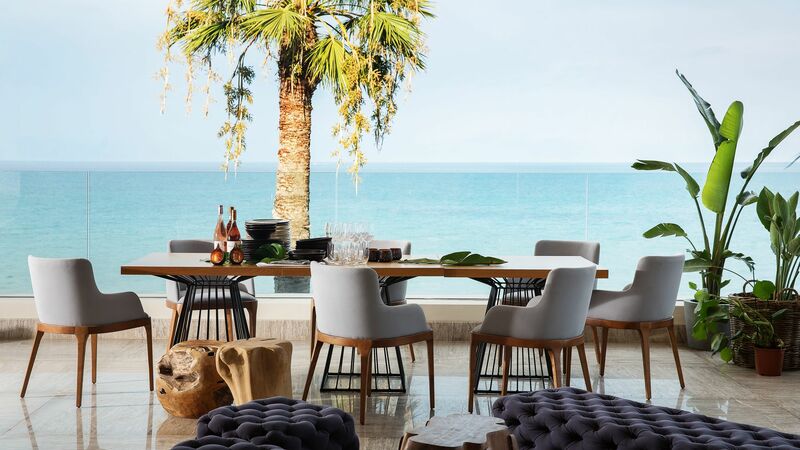 The Haute living room is set out as a VIP lounge and offers spectacular views of the Mediterranean and majestic interiors, with all day tea, coffee, refreshments and light bites to enjoy. There is also an exclusive swimming pool, which is surrounded by sun loungers and a bar. Guests will also have access to the dedicated Haute Living Manager, who is available 24/7, as well as VIP check in, express check out and a farewell gift from the hotel. Bright and spacious suites offer beautiful sea views and allow you to make the most of the outdoors. 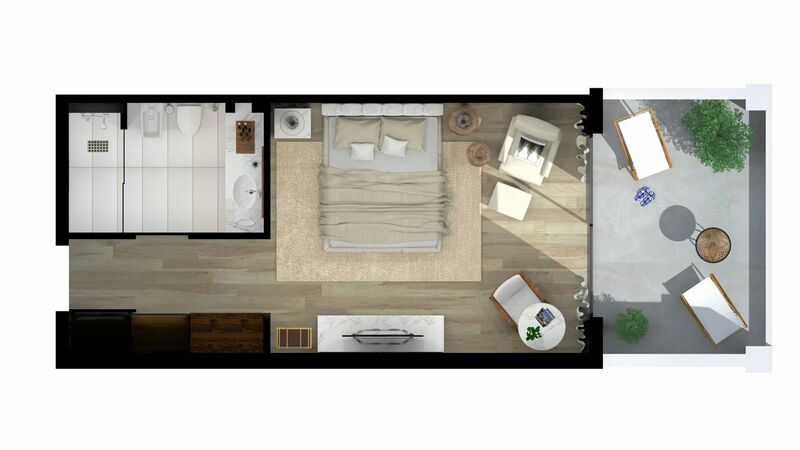 There is a large living area and bedroom with a king size bed or an open plan room with a king size bed and a sitting area. Luxurious décor and artwork can be enjoyed throughout and there is also a private garden with your own jacuzzi, outdoor shower and swimming pool. The en suite marble bathroom contains a separate bath and shower. Guests staying in the Pavilion Suite will also enjoy access to Domes Miramare’s ultimate luxury service and its ‘Haute Living’ facilities. This includes the dedicated Haute Living Manager, who can be contacted 24/7, a VIP check in and out service and a farewell gift from the hotel as a souvenir of your time here. Spend the day relaxing in the Haute living room, which is set out as a VIP lounge and offers elegant modern art and chandeliers, tea, coffee, light bites and snacks throughout the day. 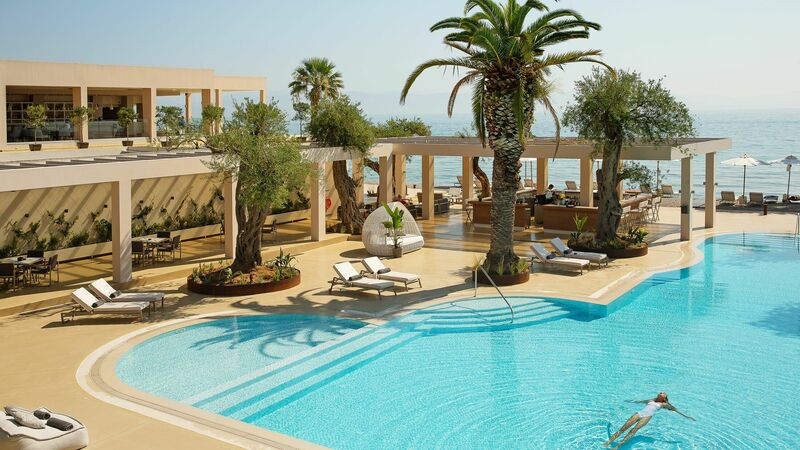 Wander out to the exclusive swimming pool and enjoy a drink at the bar as you soak in views of the Mediterranean. Make the most of the beautiful views of the Mediterranean and the Domes Miramare’s gardens in these large suites. 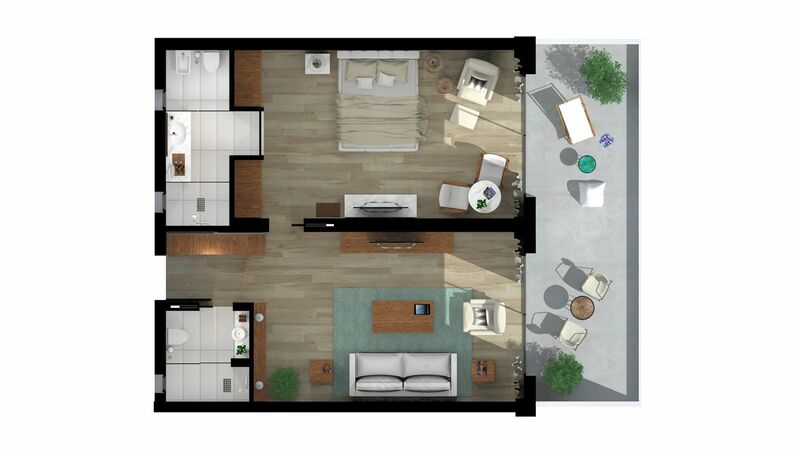 Choose from open plan suites with a sitting area with flat screen TV and bedroom area with a king size bed - or a separate bedroom and living room. Elegant design runs throughout and includes beautiful artwork. There is also a large private terrace area with stylish wooden decking, an outdoor shower, private swimming pool and views of the sea. The suites are located in the Exclusive Area of the resort. There is also a marble en suite bathroom with a separate bath and shower. Guests who choose the Pavilion Suite can enjoy complimentary access to the hotel’s ‘Haute Living’ facilities. This allows you to spend the day in the Haute living room, which is beautifully decorated with chandeliers, modern art and marble and leads out to the exclusive swimming pool. Take in the views of the Mediterranean or enjoy a drink at the bar or light refreshments, teas, coffees and more in the living room. You will also have access to the 24/7 Haute Living Manager, as well as being able to enjoy express check out, VIP check in and a farewell gift from the Domes Miramare. These bright and spacious pavilions are detached for the ultimate privacy, with beautiful sea views. There are two large double bedrooms, each with a king size bed and marble en suite bathroom with a separate shower and bath. 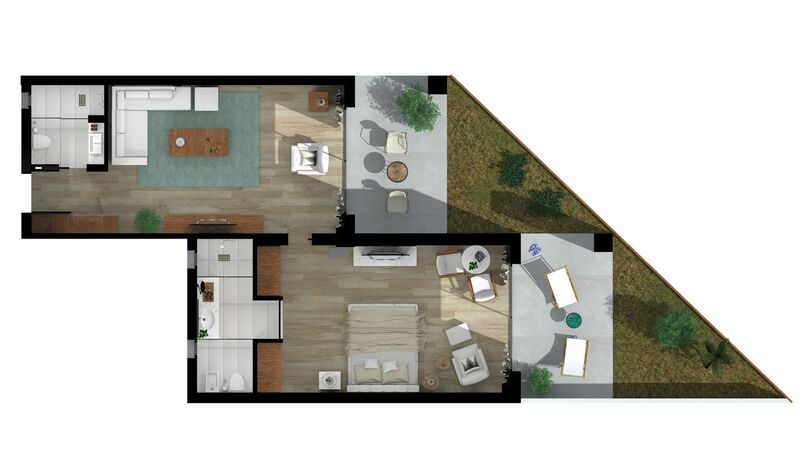 There is also a spacious living room with a sliding open roof, large flat screen TV and elegant décor. 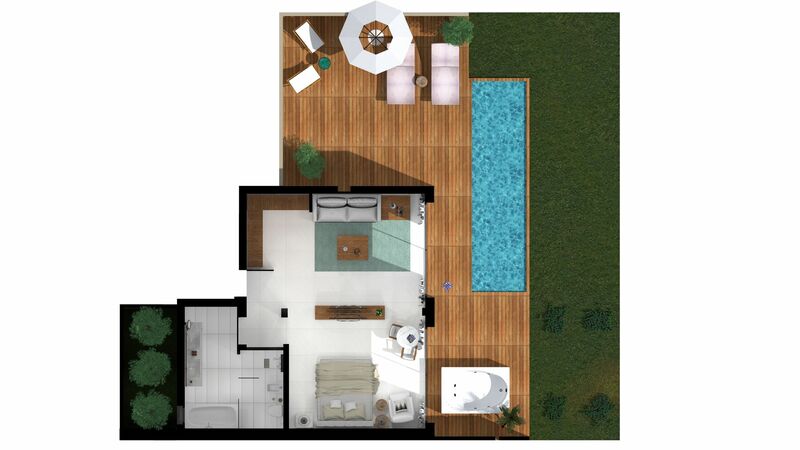 The private terrace contains a stylish wooden decking area, two outdoor jacuzzis, a large private pool and sea views. Guests staying at the Domes Miramare’s Grand Pavilion rooms are able to enjoy the ultimate luxury, with ‘Haute Living’ facilities available. This includes access to the Haute living room, which offers beautiful interiors filled with modern art, mosaics and views of the Mediterranean, leading out to an exclusive swimming pool surrounded by loungers and an outdoor bar. Sip delicious drinks, or enjoy complimentary tea, coffee, light bites and snacks all day. You also have access to the 24/7 Haute Living Manger, as well as VIP check in, express check out and a farewell gift from the hotel. These spacious pavilions are detached and offer large open spaces and sea views. 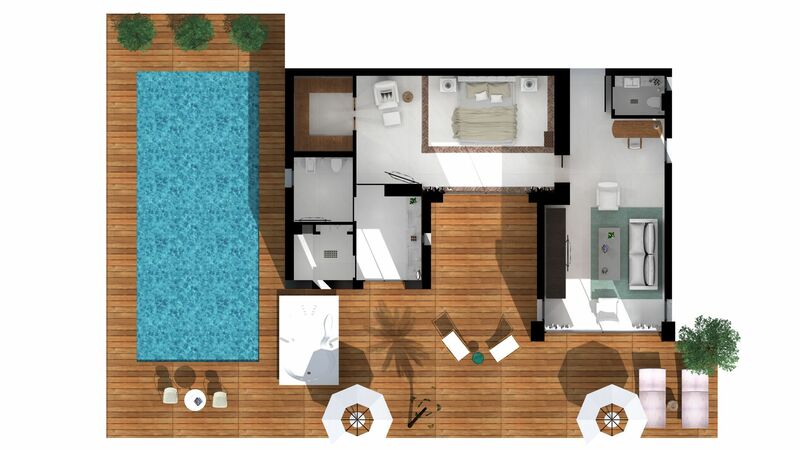 There are two double bedrooms, each with a king size bed and a marble en suite bathroom with a separate bath and shower. 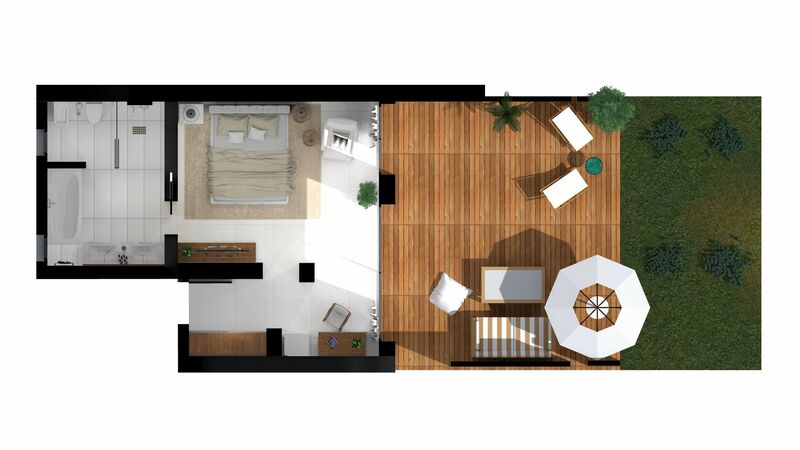 One of the bedrooms is attached to the open plan living room where there is a sitting area and flat screen TV, as well as a sliding open roof perfect for clear nights. There is stylish décor throughout, as well as a large outdoor area with wooden decking, outdoor furniture and a spacious swimming pool, and sea views through the gardens. The pavilions are set within the Exclusive Area of the resort and offer the ultimate in luxury. 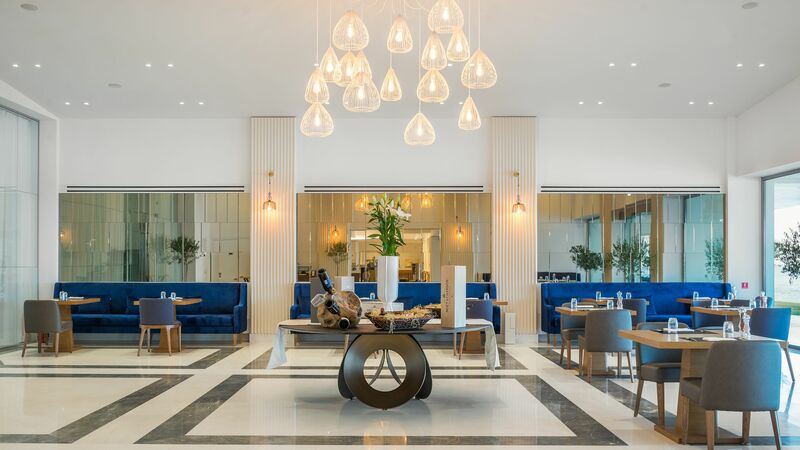 Guests who choose to stay in Grand Pavilion properties can enjoy the ultimate in luxury during their stay, with access to the hotel’s ‘Haute Living’ facilities. This includes the elegant Haute living room, which is the perfect place to relax with teas, coffees, snacks and refreshments as you take in the modern art, chandeliers and beautiful mosaics. Spend the day soaking up the sea views in the living room or make the most of the exclusive swimming pool, which also has loungers and an outdoor bar. You will also enjoy VIP check in, express check out, access to the Haute Living Manager 24/7 and a farewell gift from Domes Miramare. These detached villas are perfect if you’re looking for exclusive luxury during your stay. Pearl coloured tones greet you throughout the living room, en suite bathroom and bedroom, which contains a king size bed. There are flat screen TVs and a marble bathroom with a separate shower and bath, as well as a hammam, open air wardrobe and more. The living room contains a sitting area and elegant décor, and there is also a large private garden with wooden decking, a swimming pool, outdoor jacuzzi, outdoor shower and uninterrupted views of the Mediterranean. The villa is located in the Ultra Exclusive Area of the resort, allowing you to make the most of the fantastic facilities. For the ultimate in luxury, the HRH villas also offer access to the ‘Haute Living’ facilities at the hotel. This includes little details like express check out and VIP check in, as well as a farewell gift and direct access to the Haute Living Manager 24/7. There is also a Haute living room which is full of elegant details, including chandeliers and modern art, as well as an exclusive outdoor swimming pool and bar. Enjoy a refreshing drink at the bar or choose from complimentary snacks and refreshments in the living room. This luxurious villa offers everything you need for a relaxing stay. Fully detached, guests can enjoy exclusive privacy and elegant ivory décor throughout. There is a large living area with a flat screen TV and seating area, as well as a bedroom with a king size bed, walk in wardrobe and a marble en suite bathroom. There is also a hammam and a separate WC next to the living room. Outside you will find your own private garden with elegant wooden decking, a swimming pool, outdoor shower, jacuzzi and direct access to the sea, as well as views of the Mediterranean. 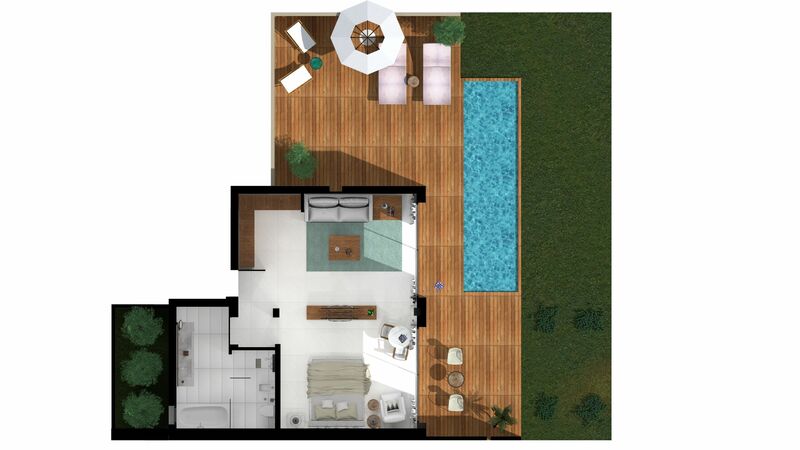 The villa is located in the Ultra Exclusive Area, giving you access to luxury amenities and facilities. For the ultimate in luxury guests staying in HRH properties can also enjoy access to the hotel’s Haute Living facilities. Choose from light refreshments, teas, coffees, finger food and more as you soak in the elegant features of the Haute living room. Alternatively, relax by the exclusive swimming pool or enjoy a drink from the bar. You can also enjoy VIP check in, express check out and a farewell gift as a souvenir of your time here. Save up to 35% discount on the hotel price for holidays between 15 April - 06 June 2019 and 17 - 26 September 2019. Save up to 30% discount between 07 - 29 June 2019. Save up to 25% discount between 30 June - 21 July 2019. Save up to 20% discount between 22 July - 16 September 2019 and 27 September - 14 October 2019. The above offers are valid for bookings made by 02 May 2019. Save an additional 5% discount, courtesy of Sovereign for holidays between 15 April - 14 October 2019 when staying in a Pavilion Retreat, Pavilion Suite, Grand Pavilion or HRH Villas accommodation. Valid for for bookings made by 02 May 2019. Save up to an additional 5% on the hotel price, courtesy of Sovereign for holidays between 15 April - 14 October 2019. Customers receive a 50% discount on the Half Board Dine Around supplement for holidays between 17 April - 14 October 2019. Three course A La Carte lunch or dinner served in Makris Waterfront Restaurant or a snack menu lunch served by the Beach or Pool or a Sushi platter dinner served in Raw Bar. Guests that wish to dine in the ‘1962 Gastronomy’ Degustation Restaurant, will be able to do so by using a Euro 15 credit per person, to be deducted from their final bill (pre booking during stay is required). For stays of 7 nights or more one Dine Out session in a selected and recommended Corfu Old Town restaurant is also included (pre booking during stay is required). Start your day with an early morning Yoga class by the beachfront. 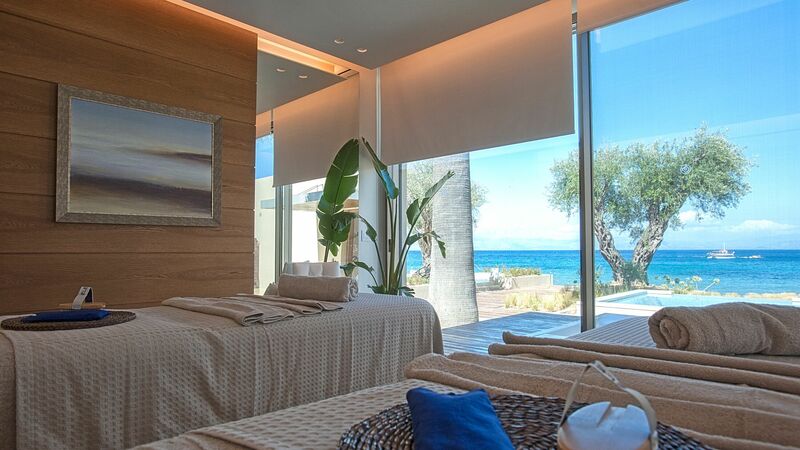 Rejuvenate your body, mind and soul whilst overlooking the beautiful Ionian Sea. Chefs at the Raw Bar will teach you in the evening how to combine local ingredients and mix your own cocktail. Enjoy a three course a la carte dinner in Makris Restaurant, whilst overlooking the deep blue of the Ionian Sea. The above Sovereign Experiences are subject to terms and conditions, a minimum of 5 nights stay is required for holidays taken throughout the season, experiences are organised on set days and times which can be cancelled due to weather conditions etc., alternative experiences will be offered in the event of any cancellation (cash value will not be offered to guests in exchange of any experiences and are offered once per person per stay). Valid for stays throughout the season. Applicable to all accommodation types. Combinable with all other offers. One chilled bottle of `Moet & Chandon` French Champagne, decoration of suite with flowers and rose petals on the bed on arrival and selection of fresh seasonal fruits and traditional Greek sweets. First breakfast served with fresh flowers. Wedding certificate required. The hotel may refuse to provide the above services in case of failure to provide a recent wedding certificate (same year of stay). Platter of seasonal fruit and one bottle of Domes Miramare Premium Wine in room on arrival. A minimum stay of 3 nights is required for all of the above offers. “ Incredible 5 day experience! My friend and I spent a week at Domes Miramare and wow, what an experience. We were greeted with a sincere and warm welcome from the hotel manager, who couldn?? ?t do enough to accommodate us on arrival. Secondly, the hotel and the view itself - just wow. The rooms were beautiful and cater to everything you would need while you are away. We had a pool view, which was lovely, and also still peaceful during the day (although on reflection we would have preferred a room upstairs as these rooms get the sun). Breakfast had everything you wanted, but we cannot also fail to mention the staff! They couldn?? ?t do enough to make our experience. In particular, the pool guys Alex and Pawel who literally made us want for nothing. We will definitely be recommending this to family and friends! Thank you, we can?? ?t wait to return! This hotel was really lovely. The staff could not have been friendlier. The location is stunning with it being right on the sea front. Room was large and spotless with a king size bed and huge tv. Food was delicious if not a little pricey, and the included buffet breakfast was fabulous. There isn?? ?t a great amount to do in the immediate local area, but the complimentary trip and tour of the Corfu old town was fab. Overall this resort is exactly what you?? ?d expect from a 5 star resort! Spent a week vacating with my sister at this beatiful hotel. We really loved every little detail, from the private checkin that made us feel very special to the friendliest staff ever at the pool bar. The room was spacious and comfy with a beautiful sea view! Champagne beakfast was the final touch that reminded us every morning that we were on vacation! We will definately return next year!! Overall this is a great place with very good service. First, the view - just stunning. Room - I think we had a standard sea view which was fine, nicely decorated and a reasonable size. A balcony overlooked the garden with the sea beyond. Common areas - all really well decorated/designed with a great contemporary feel to the whole place. Outside/pool area - area by the sea was a bit cramped in places, with too many beds. Maybe put some beds on the grass to solve this. Also some changing facilities would be good. The only showers are cramped and used by people when they come out the pool. It would be good to have somewhere dry with a couple of showers so people can change if they arrive before their room is ready or leave late after already checking out. Surrounding area - OK, a few OK bars but the walk there is not great, past piles of rubbish on the main road - something that is quite common. I assume the bin collections are sporadic. Food - Breakfast good. The usual bar snacks for lunch. It would be nice if the restaurant offered more choice on a lunchtime. Evening menu fine. I did have one problem that the hotel tried to rectify in the way they feel is correct - throw money at it. I really like sushi and my wife does not. I asked if we could have a table in the sushi restaurant and if my wife could order from the menu in the other restaurant downstairs. The manager said "yes". When we finished our drinks at the bar and went in, the restaurant manager had obviously had a change of mind and made it very clear that he was doing me a massive, one-off favour. After a few mins of feeling extremely patronised I decided not to let this go so I called him aside, away from other diners, and told him we were leaving. He eventually convinced me to stay. He then tried to not charge us. I wouldn't accept this, but after he insisted, I allowed him to provide our wine FOC. We then discovered a bottle of wine and fruit had been sent to our room as well. Another great touch - someone either noticed my date of birth on my passport or acted very quickly to the one birthday card in our room and left me a cake and bottle of Moet, with a card from the manager. Thanks for that. I feel guilty that I didn't come to find you and say thank you. Or maybe a personal touch, rather than throwing money at guest satisfaction, could have been for you to find me and say I hoped you enjoyed it. We have just passed a very enjoyable week at the Domes Miramare. The hotel is beautiful, very new and very clean.The setting is idyllic with its own beach looking out to views of mountains across the sea. We found all the staff extremely helpful and efficient. We must especially mention Marie who welcomed us with a local cocktail and gave us lots of useful information on local places to visit including some favourite restaurants. The gardens are really attractive and the very old olive trees around which the hotel is built are spectacular particularly the one in the reception area extending through the roof. Our room was very comfortable with a balcony looking out towards the sea. We would thoroughly recommend the hotel to anyone wishing to spend some time relaxing by a pool or the sea in lovely surroundings.